I was lucky enough to find a bag of shelled pistachios so I didn't have to sit there and open them up one by one. Of course having that bag in the house is very tempting. Pistachios are just so tasty. I usually only eat a hand full at a time because it takes so long to open the shells, especially the ones that don't have a crack in them. 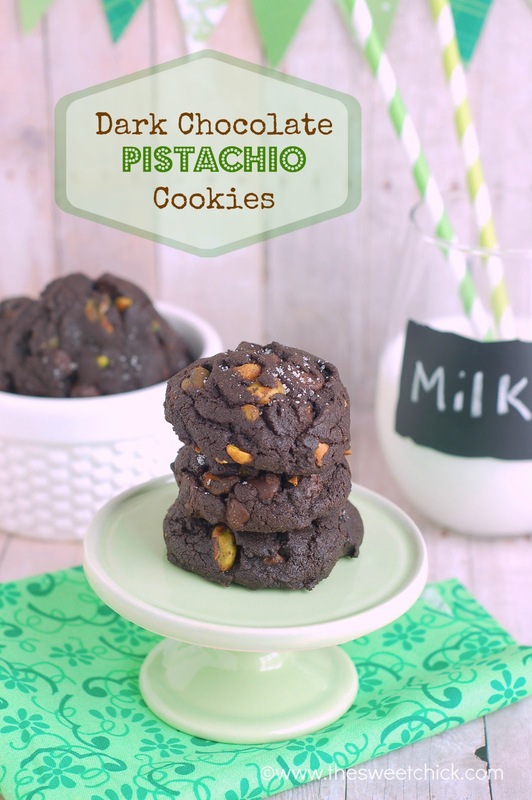 For theses cookies, I used the same basic recipe as the Dark Chocolate Cherry M&M Cookies, just changed the chocolate a bit and added pistachios instead of M&M's. I baked up one batch and did a taste taste. They were good, but lacking something. So I added a pinch of sea salt to the tops of the second batch before popping them in the oven. Oh boy, that was it. The sea salt really brought the dark chocolate and pistachio flavors together. My taste buds were very happy. Place the baking chips in a glass container and microwave at 30 second intervals until fully melted, stirring in between. Set aside. Add the chocolate chips and pistachios and mix on low until fully incorporated. Sprinkle each cookie with a pinch of sea salt. Bake at 325º F for 10 minutes or tooth pick inserted in the middle comes out with moist crumbs. Lovely cookies! I just love pistachio, but I never thought of associating it with chocolate. It sounds wonderful, I'll have to try it.